Six months after the devastating earthquakes that hit Nepal in April 2015, Elyx is invited to visit the country in order to raise awareness about the constant efforts and actions still needed in the territory, especially as winter approaches. Nepal is the crossroad of vibrant cultures, spectacular temples, breathtaking nature and landscapes, but also a vulnerable territory highly exposed to natural hazards, such as earthquakes, flooding and glacial lake outbursts. The UN Country Team in Nepal is composed of 19 agencies, which work closely together to address the social, political and economic needs of Nepal and also the ones related to risk and disaster mitigation. The UN agencies present in the territory, among which it is possible to mention the WFP, UN HABITAT and UNICEF, are all coordinated through the UN Development Assistance Framework (UNDAF), whose last version regarding the period between 2013 and 2017 has been attentively made in cooperation with Nepal’s government. Elyx is welcomed by the UN volunteers present in the territory and together they go visiting the areas still damaged and most in need due to the earthquakes’ consequences. As a first stop, Elyx explores Kunchowk VDC in Sindhuplach and there, our digital ambassador helps the UNV Nepal civil engineers to assess the damages houses. During the visit, Elyx has the opportunity to talk with a visually impaired home owner and it listens to his story about the dramatic earthquake event. Elyx is really moved by this encounter and it wants to do more for him and his community. With no hesitation, Elyx helps UNV civil engineers to collect more data, which are extremely important to allow precise and effective intervention measures. 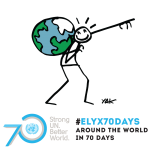 The UNV civil engineers’ work is remarkable and Elyx is happy to be part of their team today! 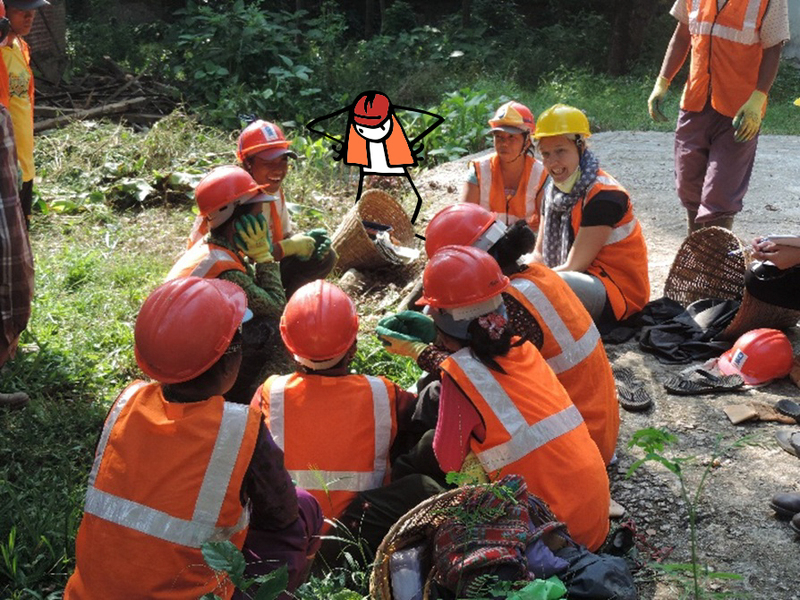 After, Elyx meets the UNV Nepal’s programme officer, Martina Voss, and it is invited to participate during a meeting with the work construction workers, mobilized for the Demolition & Debris Management Programme in Nuwakot. Elyx realizes that a lot of work is still needed in many areas and the construction of new shelters and the provision of food are high priorities. After the meeting and during a break with the UNV volunteers, Elyx learns that UNV volunteers are committed to many other activities in the territories. For instance, in Biratnagar there are events organized to raise awareness on proper garbage disposal and clean hands campaigns for hearing impaired students and staffs. Unfortunately it is already time to go and travel again, but Elyx will go back to New York remembering to encourage more help and assistance in Nepal. 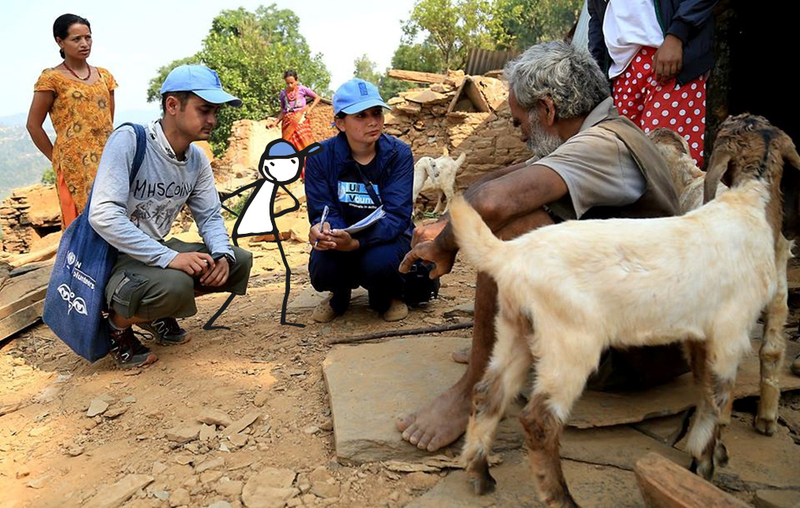 Our digital ambassador is truly overwhelmed and inspired by UNV volunteers’ work in the country and it will never forget such remarkable example of solidarity. Goodbye Nepal, for now!